There are several examples of former enemy countries reconciling and cases of former victims and perpetrators reconciling. 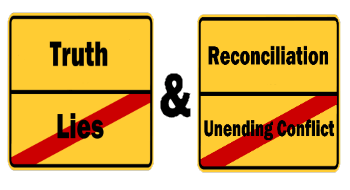 In the case of Canada and Australia, the process for trying to right centuries’ old wrongs to the native peoples was/is called: TRUTH AND RECONCILIATION. First there is truth. Then and only then, can there be talk of reconciliation. It seems that, while many people want Israel to reconcile with the Arabs who now call themselves Palestinians, they don’t want any truth to be told. When Israel talks about Jewish ties to the land, they raise the issue of Palestinian Arab ties to the land. There is no denying that there were individual Arabs living in this land for centuries nor that they have rights; however, the truth is that there never was a Palestinian nation or peoplehood and it was the Jews who were originally referred to as Palestinians. The cynical rewriting of history and redrawing of maps is something the New Palestinians, if we can call them that for short, are expert at. A totally false picture of the history of the region is being spread around the Internet in the form of a map showing the supposed shrinking of a never-existent Palestine. Edgar Davidson fights that myth by showing how it is, in fact, Israel that is dwindling in size with time. And only because Israel acquiesces to world leaders who seem to believe that if we just give up enough land, we will have peace. Davidson prepared the map below that illustrates the truth. Sequence of maps that show the truth to combat Hamas propaganda. Image Credit: Edgar Davidson, Used with permission. Many of those Arabs who now call themselves Palestinians did not claim that name until the 1960s, some a lot more recently and others still reject that term altogether. That is a truth that needs to be recognized even as we recognize that there is now a community that defines itself as a separate people within the larger Arab ummah. Those who seek to equate Jewish and Arab ties to the land do not want to talk about the truth that the Arabs were colonizers of this and many other indigenous peoples’ lands, converting many of the inhabitants to Islam and trying to get rid of those who would not convert, a phenomenon that has recently been revived in the form of the long-dead Zombie called Islamic State or Caliphate. Nor do they want to talk about the fact that among those who claimed Palestinian refugee status in 1948 are an unknown number of individuals who had migrated to the British Mandate of Palestine as late as 1946; as I indicated in a previous blog post, that was apparently all that was required to be recognized by the UN as a “Palestinian” refugee. Not many want to accept the truth of Jewish rights, legal and ancestral, to the so-called West Bank, more accurately called Judea and Samaria, preferring to see us as occupiers. And they hammer us over the head with that term, occupation, over and over again until a sizable proportion of our own people believe that to be true. A reading of history would show that, in fact, there are legal documents, that have never been rescinded, that declare our claim to sovereignty of the land in modern times. We lost some of this land in the war imposed upon us in 1948 by those who want us to disappear back into the history books. And then we regained it again in 1967 when another war was launched against us. The fact that the UN calls us occupiers does not make it true. They also call the Palestinian Authority the State of Palestine and it is not (yet?) a state. So much for the reliability of the UN and this is without even going into the UN’s horrendous imbalance regarding denunciation of human rights issues as these relate to Israel and the rest of the world. I am shocked and disappointed to find intelligent Israeli and non-Israeli Jews, many academics, who say history does not interest them as they are only concerned with what they see as our unethical and inhumane behaviours toward “Palestine” today. They accept the label “occupiers” without thinking about the fact that that implies accepting a version of the very history about which they claim disinterest. So I would like to ask those who think historical truth is unimportant in resolving present-day conflicts: if Germany had denied the Holocaust, would we have reconciled with Germany? Would we have developed the good relationship we have with that country today? I doubt it. I can imagine their come-back to that question: Can we expect reconciliation with the Palestinians if Israel does not accept responsibility for the occupation and our policy of ethnic cleansing and abuse toward them? Whether I answer this question in the positive or negative, I would have fallen into the trap of even considering the claim that Israel has a policy of ethnic cleansing and abuse and that there is an occupation. To show the truth we need to go to history. But those with whom I engaged in this discussion were not interested in any history that goes back farther than today, or yesterday’s news. End of discussion. Nobody knows how the conflict between Israel and our neighbours will be resolved or what the will solution look like. I am curious how we will all work this out. And I do strongly believe that there can be no meaningful and sustainable peace without TRUTH and reconciliation between our conflicting peoples. That means, learning the history that really happened and not the “history” that some would like us to believe, a “history” that is no more than fantasy exploited in order to gain the upper hand in the realm of international politicking and public relations. This means accepting that there is a new people who call themselves Palestinians and that these are not the Palestinians of old. This means recognizing the true origins of these Palestinians so that mutual recognition of rights can be based upon the facts. When uncomfortable truths are accepted by all — and that means Israel owning up to its wrong doings as well, of course — then responsibility can be taken for past hurts and injuries and the path to reconciliation that will stand the test of time can be embarked upon. Without that, the Middle East will be a ship of fools continuing on its voyage of the damned. This post is a modified and updated verion of a blog I posted on Time of Israel 1 May 2015.